As part of our Middle Ages theme we have been spending some time learning about Castles. The kids have enjoyed learning how castle designs developed from wooden structures to stone buildings and how so many features of the castle were for protection. Also some of the more “yucky facts” have been very popular – like that fact the moats must have stunk with all the waste and sewerage that was dumped into it. 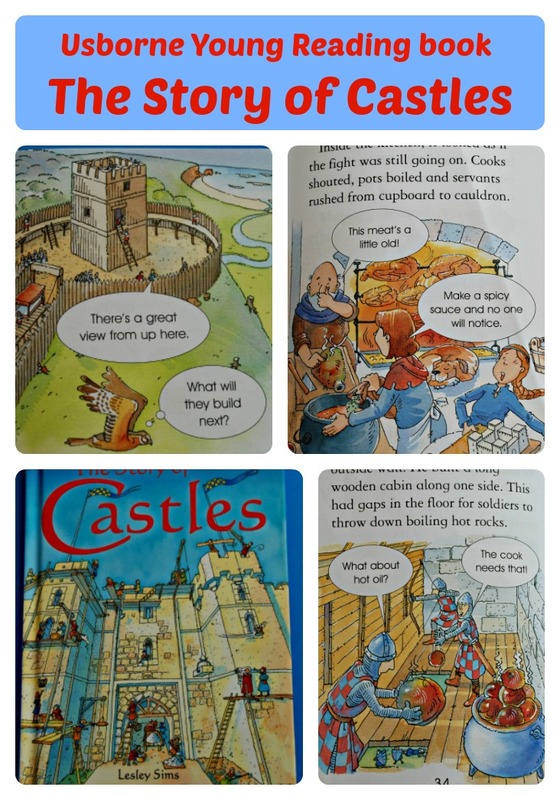 We had an Usborne Castle book in the house – Stories of Castles (Young Reading (Series 2)) (Young Reading Series Two) . It is a great book for setting the scene on how castles came about starting with basic wooden castles which were later replaced by stone castles as the wood burnt very easily. The book covers aspects of the life inside a castle, with some humourous pictures. I really like the way the book is set out as it takes the kids through the stages of how a castle evolved in a very easy manner. It explains how lots of the features of a castle where actually there for defensive purposes. The book deals with the castles being attacked in very child-friendly manner, the illustrations really help with this as the people depicted all look non-threatening. If you are looking for a child-friendly book about castles this one is perfect. It is informative and really well structured taking the kids from why castles initially came about to how castles stopped being so important. The kids had a go at filling out all the labels on the Castle and Knights Self Registration pages. My Youngest is still very much a beginner speller so I gave him the Castle and Knights Word Mat to use. Once we had filled out all the labels we tried to match as many as we could to our play mobile castle. My son enjoyed this and actually pointed out a few things about the play mobile castle that did not meet with his idea of what a “REAL” Medieval Castle would look like. My daughter also had a go at labelling this Castle diagram. And this coming week we are having a home-ed trip to a Medieval castle. The kids are very excited as their dad is coming with us and they are dying to “teach” him about castles on our little field trip. This entry was posted in History and tagged History, home education, homeschooling, Middle Ages, Story of a Castle, Twinkl, Usborne books. Bookmark the permalink.